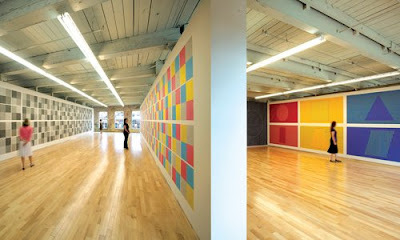 This Sunday – the great Sol LeWitt wall drawings exhibition will open at MASS MoCA. Almost an acre of LeWitt. They’ll stay up for at least 25 years. It’ll be a knockout and will change forever how you look at art and exhibitions. You too can present a retrospective of the great Wall Drawings of Sol LeWitt! You’ll need a crew. Art students will do. Also recent art graduates, and artists- if they can follow instructions. You gotta buy ’em some paint. Get the good stuff. Maybe they’ll throw in some hats. Find a large space. Very large. We’re not talking precious little miniatures. Usually, an abandoned industrial warehouse, factory, or a mill complex works well. From the days when America actually made stuff you could use. But inside you’ll have to build white walls. Lots of them. And make sure they’re to LeWitt’s specifications. Follow the plan for what goes where, or you’ll be at your wits end. Now pin up the working drawings by LeWitt so you know what to follow. They’re done by hand, not computer. So, as “perfect” as they look, they’re not. That’s refreshing. If you’re lucky, Sol LeWitt’s daughter Eva, a colorful artist in her own right, might lend you transparencies and one of those good, old-fashioned overhead projectors. Now get out your tape and mock up the walls! Remember, Sol LeWitt had helpers too. If you’ve done it all right, interesting patterns will start to appear. The world around you is transformed. show how artists use of color often changes as they age. Those are revelatory. And it’s moving to follow the artist’s path. just like at the Sol LeWitt retrospective opening at MASS MoCA November 16, 2008. Congratulations to the crew! And to MASS MoCA’s Director Joseph Thompson, and to all involved, including Yale University Art Gallery, and the Williams College Museum of Art, Williamstown, Massachusetts, and Bruner/Cott and Associates architects, who restored the building. Done in collaboration with Sol LeWitt, before his death in April 2007. The retrospective will include one hundred works—covering nearly an acre of wall surface—that LeWitt created from 1968 to 2007. Here’s how it came to be, according to MASS MoCA: Jock Reynolds, the Director of the Yale University Art Gallery, who in 1993 worked closely with LeWitt to produce an earlier retrospective of his wall drawings brought Sol LeWitt to see MASS MoCA and its Director Joseph Thompson. “LeWitt toured the MASS MoCA’s campus of industrial buildings, where the artist was immediately intrigued by Building #7. The structure, situated at the center of MASS MoCA’s multi-building complex, and featuring large banks of windows that open onto two flanking courtyards, appealed to LeWitt as an ideal site for a multifloor installation of his work. His specifications for the space included new circulation paths, including a series of “flying bridges” and newly created courtyard spaces, that will connect the LeWitt building to MASS MoCA’s changing exhibition galleries and entry lobby. Along with Tadao Ando’s buildings for the Clark Art Institute in the same area, by November this is worth a trip. Rest easy, in your pretty little town in the Berkshires, knowing you’ve added interest to the world. Rest easy too – your work lives on – Sol LeWitt. MASS MoCA has a fine website. And read Richard Lacayo’s excellent posts and interview with MASS MoCA’s director Joe Thompson: parts 1, 2, 3, 4. Do-it-yourself Sol LeWitt Wall Drawings. It’s easy! You are currently browsing the archives for the Massachusetts category.